Eddie Price is a history teacher who writes award-winning books. Widder’s Landing, a historical novel set in Kentucky in 1811-1815, has won gold medals for “Best Historical Fiction” at the Readers’ Favorite Awards and National Literary Habitat Awards, and was honored by the US Daughters of 1812 with the “Spirit of 1812 Award.” One Drop—A Slave! (2018) has already gained critical acclaim. His children’s books, Little Miss Grubby Toes Steps on a Bee! and Little Miss Grubby Toes Plays With Fire! are illustrated by Mark Wayne Adams. Eddie has won gold medals at the Readers’ Favorite Awards, the Florida Authors & Publishers Association, and the Mom’s Choice Awards. Eddie is a world traveler who enjoys bicycling, horseback riding, and swimming. He and his wife Mary now live in Hancock County, Kentucky. He has two daughters, Sheena and Breanne. The Little Miss Grubby Toes series, written by Eddie Price and illustrated by Mark Wayne Adams, depicts a series of escapades and scrapes that Little Miss Grubby Toes herself (so named because of her reluctance to wear shoes) gets into … and out of. These are cautionary tales for parents and children and, as the author points out, can be used to teach how to avoid potentially dangerous predicaments because, as any parent with young children knows, things can happen in the twinkling of an eye. This is a wonderful way for parents to explore various scenarios with young readers and discuss the pros and cons of Little Miss Grubby Toes’ often foolhardy mishaps. A good opportunity to further instill household rules and safety tips. Little Miss Grubby Toes can’t help getting into situations that might just prove to be hazardous. She is usually a good little girl, but sometimes, when she doesn’t obey her parents, she gets into trouble. Little Miss Grubby Toes’ latest adventure - Little Miss Grubby Toes Plays With Fire! - starts when she attends Tommy Sim’s fifth birthday party and his mother lights the candles on the cake, using matches. Little Miss Grubby Toes is enchanted at the sight and asks if she can light a match, only to be told firmly by Tommy’s mother that matches are very dangerous, and she must wait until she is older. On the way home from the party, Little Miss Grubby Toes asks her mother about lighting a match, only to be told the same thing; fire is very dangerous. Little Miss Grubby Toes promises her mother that of course she would never play with matches. Even though her mother, just to be on the safe side, hides the matches away, that’s not going to stop Little Miss Grubby Toes now, is it? I loved this book and a lot had to do with the absolutely fantastic illustrations! Mark Wayne Adams knows how to capture each scene so beautifully, from the fun of the birthday party, to the antics of the family cat and bird begging Little Miss Grubby Toes not to do it, to the utter devastation of the kitchen when the inevitable happens. These images alone tell the story to the youngster being read to or reading on their own, and there is so much detail as well for young readers to discover with each rereading of this cautionary tale. The themes are so naturally woven into the tale that youngsters will learn what to do and what not to do as they progress through the story. There is also a nice moment of saying sorry when you have done something wrong and caused a whole lot of inconvenience for others, and how to make it better. Another salutary lesson is keeping a promise made to your parents and listening to your parents, who are making rules to protect you. This is the first book in Eddie Price’s series that I have read, and I am now a fan. I also liked the fact that interspersed in the text were various questions youngsters might need to answer, questions that are useful and will teach them something. Ending off the story, a quiz and word search enable both parents and teachers to raise discussion points in a fun way. This section also engages youngsters in the series and will make young readers who are new to the series eager to read more about this adorable sometimes-naughty little girl. Little Miss Grubby Toes Plays with Fire! is an educational children’s book written by Eddie Price and illustrated by Mark Wayne Adams. Little Miss Grubby Toes, so named because of her insistence on a no-shoes policy, attends a birthday party. While there, she observes matches being used to light candles. As the match lights up, the flame thrills Little Miss Grubby Toes and she also wants to light one, but is told that it is too dangerous for her to do so. Little Miss Grubby Toes obsesses about the flame and is determined to light a match at home. She sees where her mother hides the matches and decides to climb up and strike one while her mother is outside. Fascinated by the flame, Little Miss Grubby Toes does not realize that it will burn her fingers until it is too late. As the flames spread to the curtains, Little Miss Grubby Toes finally realizes that playing with fire never ends well. I found Little Miss Grubby Toes’ antics with fire to be rather intriguing and, as I read on, feared that her obsession would lead to a disastrous ending. This story is not only a must-read for young children (or a read-to book), but is also a book for new parents so that they can see the challenges they might be faced with as they start a new family. Safety around the home (or even outdoors) is essential for children to learn as there are so many hazards which can quickly lead to an outcome which nobody could possibly have foreseen unless prepared. Teaching fire safety is of the utmost importance at a very early age. Failing to do so will result in much loss and devastation – even tragedy – once a youngster’s curiosity gets the better of them. It is also essential to teach a child how to ring the emergency number in their country, along with learning how to spell own name and address, which will be required for the emergency services operator. I strongly recommend Little Miss Grubby Toes Plays with Fire! 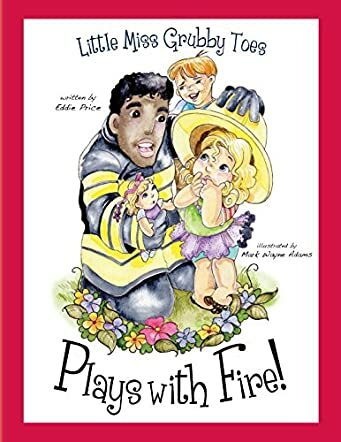 be stocked in early learning centres, hospitals, day care centers and in home libraries so that the ever-important message of fire safety can be learned by not only children, but by people of all ages. Children and parents will enjoy reading Little Miss Grubby Toes Plays with Fire! because it is a fun story that teaches a valuable lesson about playing with fire. The newest book by author Eddie Price is a story involving a five-year-old girl nicknamed Little Miss Grubby Toes. She’s curious about matches after she goes to a birthday party. Should she try striking a match? She promised her parents she wouldn’t. She is torn. Should she or shouldn’t she? This is a good time to remind children that they should listen to their inner voice within them—if it doesn’t feel right, don’t do it. After reading this book with children, parents and teachers may wish to review their escape plan and meeting place if there is an emergency. Do they remember what telephone number to call if there is an emergency? I highly recommend Little Miss Grubby Toes Plays With Fire! for schools, libraries, and homes. Parents and teachers will like the interactive pages at the back of the book. Little Miss Grubby Toes Plays with Fire! includes a quiz and bonus question at the end that teachers—and parents—can ask children and start a conversation. I like the “Find These Words in the Story" page because it encourages children to look through the book again and reinforces the message. Illustrator Mark Wayne Adams provides cute, colorful artwork on every page. His illustrations are realistic but adorable and fill the page with bright, bold colors. Author Eddie Price is a retired history teacher who has discovered what children like to read, while providing subtle messages. This is a lovely children’s book with important lessons for young readers. The little girl’s father has nicknamed her Little Miss Grubby Toes, as she loves to go barefoot and has dirty feet. When she went to Tommy Sims’ fifth birthday party, she became fascinated with his mother striking a match to light the candles on the cake. She asked Mrs. Sims if she could light a match too, and Mrs. Sims taught the little girl about the dangers of fire. That evening, Little Miss Grubby Toes asked each parent if she could start a fire with a match, and they also talked about the dangers. Although she promised not to play with matches, the child disobeyed them. In Little Miss Grubby Toes Plays with Fire! written by Eddie Price and illustrated by Mark Wayne Adams, the consequences of disobeying one's parents are clearly portrayed. There are several distinctive features to this children’s book. During the story, there are questions for the listening child, an effective method for thought-provoking conversation. The reminders to have a smoke alarm and fire extinguisher in the home are beneficial for all families. The realistic consequences – from burning her toes to expensive home repairs - of the little girl’s actions are very important for children to understand. Eddie Price has written a memorable story and Mark Wayne Adams has drawn beautiful scenarios to create a remarkable children’s book in Little Miss Grubby Toes Plays with Fire! This book is one of a series in which likeable, but stubborn, Little Miss Grubby Toes has more lessons to impart to children! Little Miss Grubby Toes Plays With Fire is written by Eddie Price and illustrated by Mark Wayne Adams and is a further adventure in the Little Miss Grubby Toes series, stories of a mischievous little girl who always seems to be getting into trouble. In this story, Little Miss Grubby Toes goes to a birthday party and is fascinated by the lighting of the birthday candle, and wants to light a match herself. Even though her parents both tell her this is dangerous as she could burn herself and cause damage, she is quite determined, and after discovering where her mother has hidden the matches she strikes a match, and the inevitable disaster happens. The author, Eddie Price, has done a really good job of combining not only a captivating story, but lots of advice for little ones who might have this story read to them. As well as the danger of matches, there is the importance of listening to instructions, what to do in the event of a fire, remembering your address and what number to call in an emergency, and how to say sorry. The story is enhanced by the wonderful and colourful illustrations by Mark Wayne Adams which really draw the reader’s eye and depict the story perfectly. Add to this the interactive aspects and this is a lovely book for parents or grown-ups to read with a young child to address some of the issues raised. It would also be a useful tool in kindergarten for a teacher’s aide. A great book and doubtless a great series.